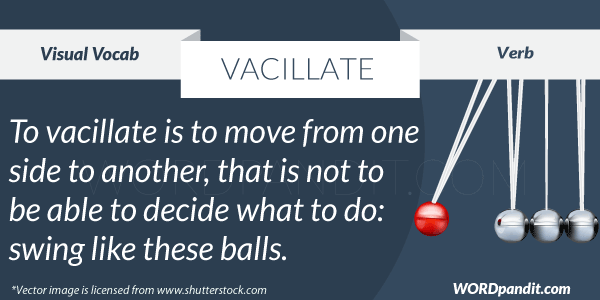 You have to agree with us when we say that vacillate sounds like Oscillate and this is what you need to remember in order to learn the meaning of this word. 2. to sway unsteadily; waver; totter; stagger. 3. to oscillate or fluctuate. 1. His tendency to vacillate makes him a poor leader. 2. Unable to decide on which restaurant to enter, she vacillated for hours before opting for Italian. 3. Pick a direction and go with it instead of vacillating back & forth.